Go the speed limit so you never run the risk of a ticket! Of course, the best defense against a ticket is not to do anything that would warrant the receipt of a citation in the first place. And MVD Express never condones breaking the traffic laws for any reason, but you might find yourself in a situation where you were cited for something that was out of your control, like being ticketed for non-payment of a parking fee because the meter wasn’t working or speeding in a school zone when the warning lights were broken. In this case, you might try to explain yourself in order to ask for lenience. There are a few things to keep in mind when attempting to plead your case to a police officer after being pulled over or before they write a ticket. Show the officer respect and courtesy. Remember that they are in charge while answering questions. Always keep your hands visible and your car off. You don’t want to make yourself look suspicious for any reason. Follow all directions. An officer has the ability to write you a ticket or to let you off with a warning. You can state your case to them politely while following directions, like handing over your license and insurance papers. If you are still issued a ticket, you can request a court date by checking the Traffic Arraignment box on the citation before signing it and returning the original copy to the officer in order to plead your case in court instead of admitting fault immediately. The officer who wrote your ticket does not show up. 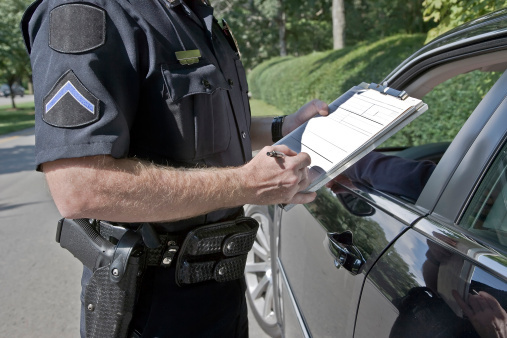 If the officer who wrote your ticket does not attend your hearing, your case will automatically be dismissed. You agree to attend driving school. Minor speeding violations or other traffic citations might be dismissed if you have a clean driving record and agree to attend a driver’s education program. Keep in mind that these suggestions are for minor infractions in the traffic laws. If you received a citation for something like reckless driving or DWI, penalties are more severe. It may be in your best interest to hire a lawyer to give you sound legal advice for your particular case. Tried and Couldn’t Get out of Paying the Fine? If you have exhausted all of your options but are still found to be responsible for paying the citation you received, you can take care of your payment at MVD Express. We’ll get you in, done and on your way with as little interruption to your day as possible. Don’t wait to pay that speeding or parking ticket. Come see us today!